Oliver Sollee, Ben Sollee, Roland Hagan (RUMFS), Vinny Turner (Forsythe NWR), Harrison Goodale (Sustain). I’m back from a brief visit to the southern shores of New Jersey. 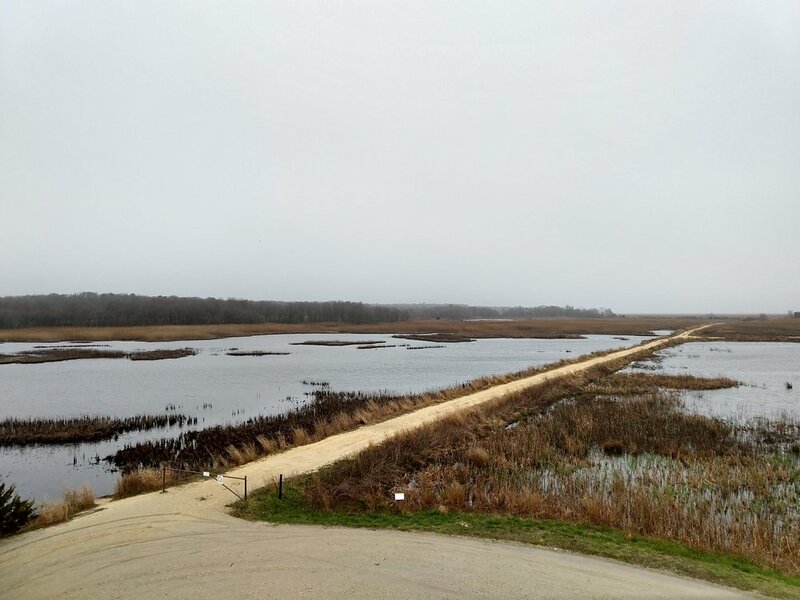 Songscape: Forsythe National Wildlife Refuge features a new ecosystem for us- the salt marsh estuaries. I was excited to get back to the area of Tuckerton, NJ, which in the late 1700’s was the third largest port in the U.S. behind Boston and NYC. The first time I was there, I was playing with my band Parsonsfield at a house party for a group of marine researchers. It was here that I met Roland Hagan and Ken Able. When Sustain was co-founded a few years later, they were on the top of my list for collaborators. The folks down at the Rutgers University Marine Field Station (RUMFS) are fiercely passionate about the environment and have an equal enthusiasm for music. As the city and industrial buildings that many associate with NJ began to fade into the distance, I began to see the pine forests and catch glimpses of coastal salt marshes. Once I got off the parkway, I received a text from Roland informing me that Ben Sollee and his family were out watching the herring spawning event at Batsoto State Park. This was a foreshadowing of Ben’s eagerness to engage and experience all the estuary and refuge had to offer. Soon after I arrived to the dorms, Roland appeared. Roland is the man connecting all the dots, making sure everything runs smoothly, all with a grin and a laugh. Close behind was Ben and his family- his wife, 10 year old son, and an infant daughter. 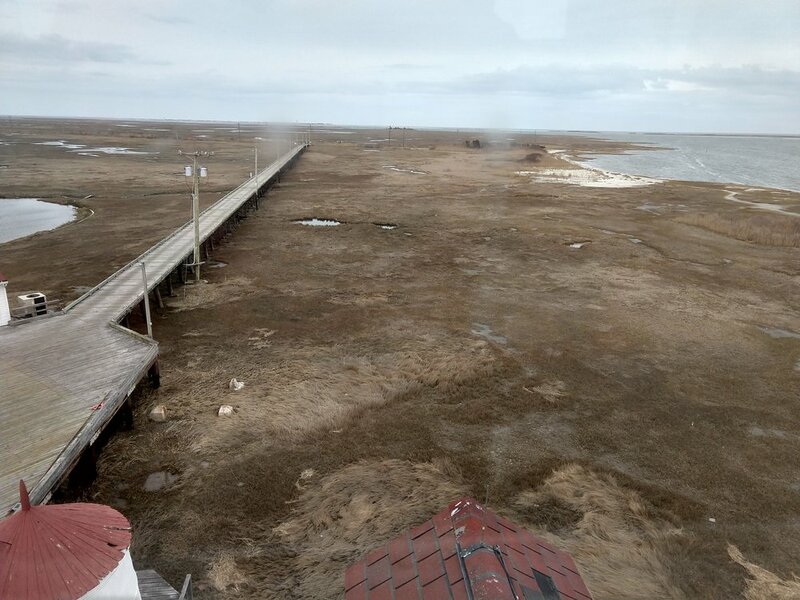 View of the plankway from the old Coast Guard Station, now RUMFS. We headed over to the RUMFS, formerly a U.S. Coast Guard Station in the 1800’s. It is located at the end of a 7 mile road interjected with rickety wooden bridges that span the various estuaries running into the Great Bay. On either side you can immediately see Great Egrets, Snowy Egrets, Ospreys, Plovers and a dozen other sorts of waterfowl amidst the reeds and shore grass. Then the road ends, and a boardwalk on pylons extends a quarter mile onto the salt marsh to the very edge of what is possible without ending up in the ocean. It is there that the Field Station stands, on a network of pylons, overlooking the Bay and a peculiar view of Atlantic City looming in the distance. A strange juxtaposition of one of the most pristine estuaries in the country with Atlantic City, all within a few miles of each other. The welcome party was very similar to one of Roland’s Folk Across the Street concerts. Lots of food, drinks and good people. And thankfully Dr. Ken Able was there to help enlist the marine science grad students to help with set up. There were local fisherman, guides and others who love the ocean, and all couldn’t wait to meet Ben. Ben played an amazing set, everyone was captured by the songs, including maybe a ghost of a former Coast Guard officer who was sitting in a rocking chair on the outside porch watching the sunset. After the festivities, I headed up to Newark to collect the videographer for the project, Mallory Cunningham, and after 10hrs of driving that day I was ready for bed. The next morning was overcast with periods of rain and quite a bit of wind. 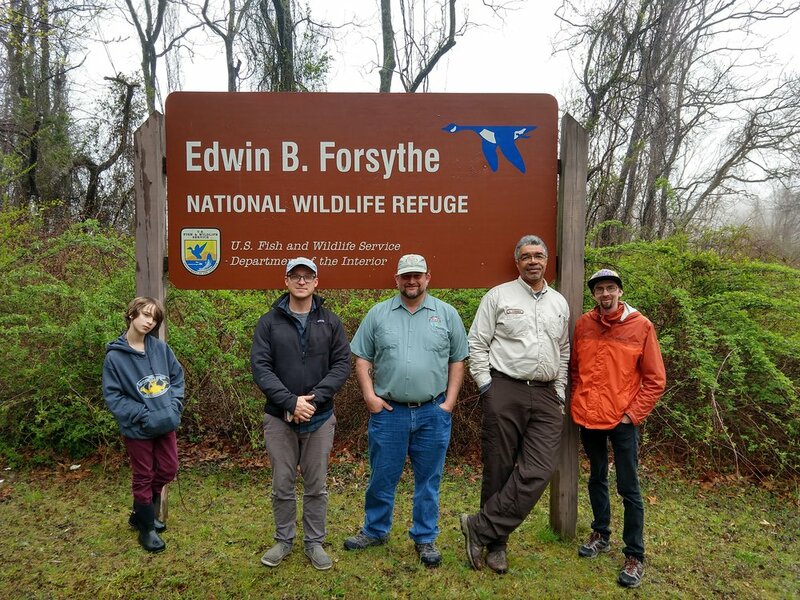 So when we arrived at the Forsythe National Wildlife Refuge headquarters, we were informed by refuge biologist, Vinny Turner, that going on the boats was not going to be an option. So we piled into a couple white trucks and a mini van and took the 8 mile loop around the salt marsh. Vinnie was an excellent guide, his knowledge of the area and wildlife was engaging. He explained the impacts of Hurricane Sandy on the Refuge, pointing out an area of hardwood forest that had been killed when the sea surge flooded the area. Ben, armed with his zoom recorder, had a particular interest in collecting field recordings and loved the poetic nature of certain scientific terms like site fidelity. Ben also was great at pointing things out to his son Oliver and took every opportunity to get out in the wind and the rain to observe the wildlife. One of the highlights of the morning was seeing an Osprey veraciously eating a fresh catch on the side of the dirt road, not 6 feet away from us. Vinny and Roland both said that was a new experience for them too. In the separate mini van that carried Mallory and Ben’s wife Catlin and little baby Clara, Ben would regularly tell Mallory what shots to get over speaker phone. Amazingly Clara slept the entire wildlife tour. Vinny enjoying the sea breeze. After the tour, we stopped back at the Forsythe nature center where we met up with Kevin Riordan from the Philadelphia Inquirer and talked a bit about the Songscape project and Ben’s background in environmentalism. We parted ways after a group lunch, I back to CT and they off to Holgate Island, a remote strip of beach that is off limits to human access because of its importance to nesting Atlantic Brants. As I headed back on to the pike, and the city and industry buildings returned to view, I thought about what Ben and his family must be seeing, standing on the edge of the ocean, with no one else around. Listening to the wind carrying the calls of sea birds, being invited to experience what guardians like Vinny, Roland, and Ken feel every day.